A few nights ago I had hours to kill before work (I hadn't slept) so I stayed up swatching and taking photos like a mad woman. I want to get back into the swing of things properly. I just realised it's mostly M.A.C products though, oops. 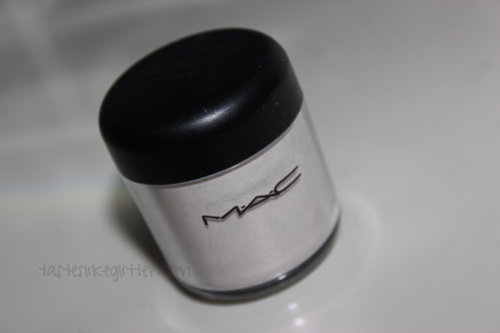 So let's start with one of my most favourite M.A.C products of all time, of all time. Pigment is a highly concentrated loose colour powder that contains ingredients to help it adhere to the skin. Pigment comes in an excellent range of colours. Use to create a subtle wash of colour or an intense effect. Pigment does not streak or cake, is easy to blend and long-lasting. Let me first start by saying how long overdue this is - looking at my archives I purchased this in '09. M.A.C changed the pigment jars over 2 years ago. Since then I've only purchased one. The last point they made is that sometimes the jars look less full as some pigments way more than others. Yes your eyes are seeing that correctly, virtually none. So whilst the pigments are expensive you do get a lot for your money (less now with the new jars), I will probably never get through this but at least I'll always have it. 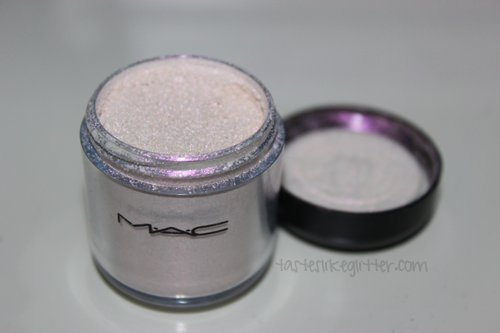 M.A.C describe Pink Opal as a bright white with a pink duochrome. This is what first captured my attention with duos and made me lust after anything with that finish. This colour is quite subtle so you can use it in a multitude of way, I like to use it as a highlight. Especially as a brow/inner corner highlight when doing purple or pink eye looks. It especially goes well with M.A.C's Parfait Amour and Urban Decay's Fishnet eyeshadows as they both have the same pink shift. Another way I've used it is just wearing simple black liquid eyeliner and dusting this over the top of the liner, you get the look of a bold wing but with a shimmery finish that still lets the darkness shine through. It's such a beautiful colour and I definitely would suggest picking it up if you don't mind working with pigments.